There is so much that 19 Girls and Me gets right that I suspect I'm more disappointed than I otherwise would be with the one aspect I think it gets wrong. Nonetheless, this is a lovely children's book and one that I will consider giving as a gift. Written by Darcy Pattison and illustrated by Steven Salerno, this picture book first grabbed my attention with its terrific eye-catching cover. The story follows new kindergartner John Hercules Po, who arrives on the first day of class to find that he is one boy among nineteen girls. His older brother warns him that all those girls will turn him into a sissy, but John learns that his new friends are just as imaginative and active as he is, and they add new elements to their play that he might not have thought of. First what's right: The cover shows all twenty students, and I love that they're not monochromatic. Several ethnicities are represented, and I'm amazed how Salerno managed to create twenty distinct characters using very simple lines. Even better, all of the children appear on almost every page, and they each retain their distinct characteristics -- in fact, on repeat readings, it would be a fun game to have a child pick their favorite character on the cover and then find that character on each subsequent page. Aside from the characters, the rest of the illustrations are colorful, appealing, and even imaginative in the way they are positioned on the pages. The text is also fun. 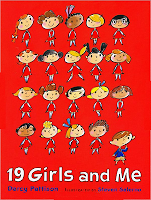 There is just enough repetition that the phrase "nineteen girls and one lone boy" becomes familiar but not tedious. The children have lovely imaginative adventures, such as climbing Mount Everest, digging a tunnel to China, and floating down the Amazon River. So what is my one quibble? Each day when the children go out for recess, John is the one to decide on the imaginative adventure of the day. Perhaps it could be argued that it's necessary for the repetitive structure of the story, and I do like the fact that once John has started the adventure, the girls add some new element to it. But couldn't this story have been told with a different child instigating the adventure each day? Is it really realistic that out of a group of nineteen little girls, not one of them would be outgoing enough to propose an adventure? Seriously, on the first day of kindergarten, would nineteen little girls allows one little boy to become the group's de facto leader? They do still contribute, and I don't want to be too hard on an author and artist who are clearly attempting to show that both sexes have value -- it's the point of the book, in fact. But I'm a little uncomfortable with it the way it is, and really would have loved it if a different child proposed the adventure each day. This concern also extends to the illustrations, as much as I love them. When John proposes climbing Mount Everest, he is shown as the first up the ladder, with nineteen little girls following behind him. When they build a race car, John is shown driving it with nineteen little girls sitting behind him. To be fair, when the children reach the Great Wall of China, the children march along behind a Chinese soldier and John is third in line rather than first, and the Amazon and skyscraper/moon adventures are not so "ordered" that it's obvious that one child is leading. But the illustrations of John on the ladder and especially driving the race car really jumped out at me, in spite of the fact that I am usually not hyperaware of this kind of thing. As I said, the book has far more going for it than not, and I truly do love the illustrations. I think, though, that I'd be much more comfortable giving this book to a little boy than a little girl. Overall it's a great message for boys -- it's not only okay, but often a lot of fun to play with girls. Better yet, they should be thought of as friends, not pointedly as girls. However, I'd be less likely to give this book to a little girl, because I wouldn't want her to absorb the message that the boys think up the ideas and the girls follow. On the one hand, I managed to grow up and be pretty assertive, even though I'm sure I digested lots of biased books and television shows in my childhood. On the other hand, studies have shown.... well, you know what studies have shown. Many little girls grow up unable to assert themselves. In the end, in my opinion this is a very good book. It's just not quite great, which it could have been.